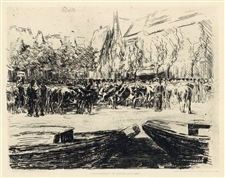 Max Liebermann original etching "Rindermarkt in Leiden Holland"
Medium: original etching. Published in Vienna by Gesellschaft für Vervielfältigende Kunst in 1900. The plate measures 9 3/8 x 11 5/8 inches (235 x 295 mm). A fine, dark impression printed on wove paper with full original margins. Not signed. Medium: original etching. 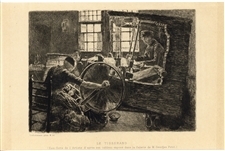 This original Max Liebermann etching was published in Paris in 1901 by Gazette des Beaux-Arts (reference number Sanchez & Seydoux 1901-13). A fine impression on cream laid paper, the plate measures 4 5/8 x 5 3/4 inches (119 x 145mm). Not signed. Condition: there is a small hole in the paper near the center of the etching (see the second photo). Medium: original etching. This original Max Liebermann etching was printed on laid paper and published in Berlin in 1919 by Paul Cassirer. Size: 5 7/8 x 7 7/8 inches (150 x 200mm). Paul Cassirer was an important German art dealer, who was instrumental in promoting various Impressionist, Post-Impressionist and Expressionist artists, including Van Gogh, Cezanne, Manet and Munch, among many others. Not signed. 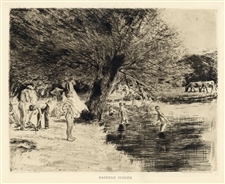 Medium: original etching (etched by Max Liebermann after his own painting). This impression on laid paper was published in Paris in 1898 by Gazette des Beaux Arts. The image size is 5 1/2 x 7 5/8 inches (142 x 195 mm). The margins appear to have been trimmed. Not signed.